CAPE CANAVERAL, Fla. (AP) — NASA has accepted delivery of a key European part needed to power the world’s next-generation moonship. 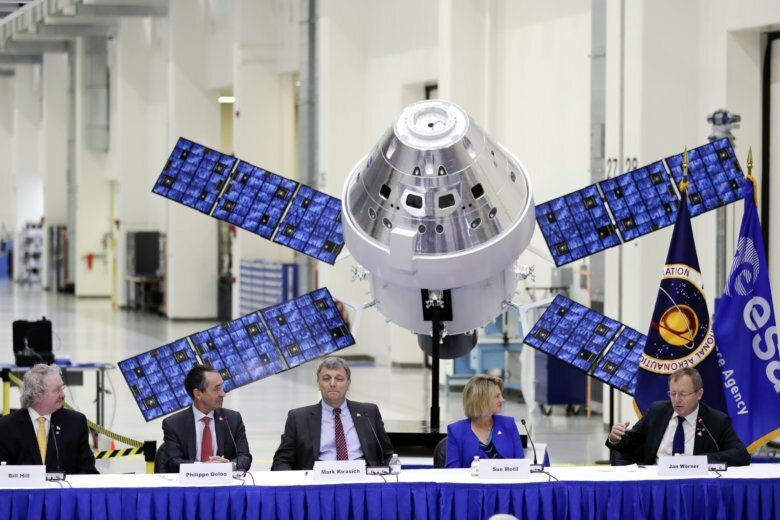 The newly arrived powerhouse, or service module, will propel NASA’s Orion capsule to the moon during a test flight without passengers planned for 2020. A mega rocket under development by NASA, known as SLS for Space Launch System, will launch the combo. The European component “allows us to take people farther into space than we’ve ever gone before, so it is a really big event for all of the Orion program,” said NASA’s Orion program manager Mark Kirasich. The European Space Agency’s director general, Jan Worner, stressed to the crowd, “We will not go back to the moon, we will go forward to the moon.” That’s because it will be in “a totally different way” involving cooperation rather than competition, as was the case during NASA’s Apollo moon-landing program of the 1960s and 1970s. On its only spaceflight to date, the Orion capsule soared more than 3,600 miles (5,800 kilometers) above Earth in 2014. The second, considerably more distant demo will come in 2020 with the Orion and service module; that will mark the SLS’ launch debut. This mission has been repeatedly delayed.